Captain John Quilliam RN was a Royal Navy officer who served as First Lieutenant on HMS Victory at the Battle of Trafalgar. The Isle of Man has a strong tradition of service in the Royal Navy and Quilliam is one of the best known local heroes. In trying to come up with a Manx hero for my next book, the story of Quilliam seems like a good place to begin my reading. Captain John Quilliam RN was born in Marown on the island on 29 September 1771 and died in Michael at the age of 58 after a long and distinguished career. His parents, John Quilliam and Christian Clucas were farmers at Ballakelly and the young John was apprenticed to a stonemason and then worked as a labourer when he was picked up by a press gang in 1794 at the age of 23. During the Napoleonic wars the press gang operated a number of times on the Isle of Man. The Duke of Atholl was known to have offered financial incentives for men to volunteer for the navy in the island but there were still not enough recruits and Manx sailors were considered particularly valuable by the navy to such an extent that the press gang received an extra bonus for any Manxman taken. The island was dependant upon its fishing industry and at times it was disrupted as the fleet did not dare to put to see for fear of being apprehended by warships looking for men. In 1798 forty men were impressed in Port Erin bay despite protests from the Governor and the House of Keys to the Admiralty. Another raid in 1811 by the warship Maria took twenty fishermen and a number of men of the Manx Volunteers in a violent attack. In theory the press gang were only allowed to take those with seafaring experience between the ages of 18 and 55. In times of severe shortage however these rules were relaxed and any man was at risk. In 1810 the press gang invaded Onchan Parish School on the island, terrifying the children who fled from the school. A boy of around 14 was seized by the gang but they were obliged to release him when a group of local women pelted them with stones. On other occasion the gang would seized labourers, farm workers and shop boys on their way home and once aboard ship they listened to no excuse having heard a wide variety of them over the years. Local young men would run for cover when the press gang was scouring the area and there were specially constructed shelters in the hills. Apparently, a field next to Jurby Parish School called Ballaconney which was thickly covered in gorse was a popular refuge for local youths dodging impressment. It is hard to blame them given that those taken would often not return for many years. Once taken into service, a pressed man would usually be given the option of becoming a volunteer for which he would be paid a bonus. If he chose not to do so his freedom would be very limited. Desertion rates in the navy were so high that even volunteers were seldom allowed shore leave when in port. Food, drink and women were ferried out to the ships to try to avoid losing half the crew every time the ship was in port. In theory, landsmen and ‘gentlemen’ were exempt from impressment. In practice this was sometimes ignored. If a warship was particularly short handed, with the prospect of battle looming, it was not uncommon for a captain to turn a deaf ear to a pressed man claiming exemption from impressment. Unlike in the army where there was a term of service, even when that was for life, sailors signed on to a ship for a particular campaign and once that was over they were discharged although they could sign on again. Obviously during wartime, a campaign or commission could last for years, so for a pressed man without any way of returning to shore and his previous life, it might well have seemed best to make the most of his time at sea. The hero of An Unconventional Officer, Paul van Daan, was the son of a gentleman, a wealthy ship owner, who was almost fifteen when he was pressed into the Royal Navy. The circumstances were unusual. The ship on which he had been serving an apprenticeship had gone down in a storm and Paul and a few of the crew had made it to shore on Antigua when a press gang picked them up. In the middle of a group of sailors, the young Paul would have looked no different and an unscrupulous press gang with a quota to fill did not care. Back in England with the formal process of magistrates and paperwork it is unlikely that Paul’s naval service would have lasted much beyond a few days but the exigencies of war in far flung places and the desperation of some captains to crew their ships meant that it was convenient occasionally to turn a deaf ear to protests. Captain John Quilliam RN was another man who should not have been eligible for impressment as a farmer and labourer, although we do not know very much about his early life or the circumstances of his impressment. Many Manxmen with land based jobs were also part time fishermen and there is no reason to suppose that Quilliam had no experience at sea when he was seized; he might well have been an experienced sailor. With only vague details about the circumstances of his joining the navy, it is not certain if he was pressed or volunteered although local legend is in favour of the impressment story. Certainly both Quilliam and my fictional character, unlike most impressed sailors, decided to make the most of their chances in the navy. Paul van Daan only served for two years before his wealthy father realised he was alive and brought him home but in that time he had risen to be a petty officer, the naval equivalent of an NCO in the army. John Quilliam served for longer and rose rapidly. He is first recorded in 1797 when he would have been twenty six and three years at sea and he was made a Lieutenant at the Battle of Camperdown by Admiral Duncan. In 1799 Quilliam took part in the capture of the Spanish treasure ship Thetis and received prize money of over £5000. He fought at the Battle of Copenhagen in 1801 as First Lieutenant on HMS Amazon. The design of the Amazon meant she was able to get close under the shore batteries, an important but very hazardous undertaking which led to every one of the higher-ranking officers beingkilled leaving Quilliam in command of the badly damaged ship. 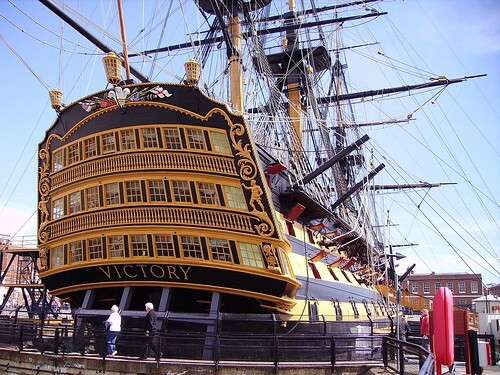 His gallantry and calmness under fire and the way he took command was rewarded with being made First Lieutenant on HMS Victory by Horatio Nelson. 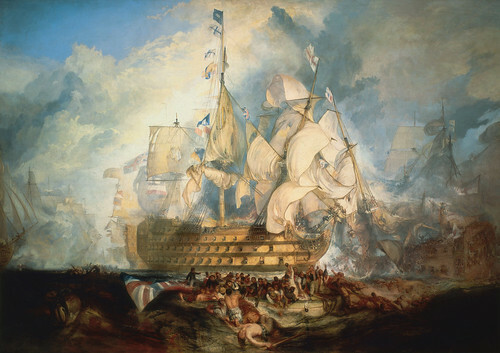 After Trafalgar, Quilliam was promoted to Captain and placed in command of HMS Ildefonso, a Spanish ship which needed refitting at Gibraltar. He did not arrive back in England until 1806. 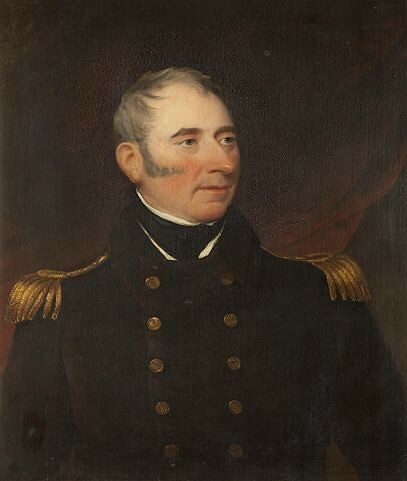 In 1808 he captained Admiral Stopford’s flagship, HMS Spencer and then in 1812 he was captain of HMS Crescent on the Newfoundland Station and remained there until Napoleon’s defeat in 1815. His exploits included the capture of the 14 gun American privateer schooner the Elbridge Gerry together with her crew of 66 men. Quilliam was elected to a seat in the Manx Parliament, the House of Keys in 1807 even though he was then still an active serving officer. 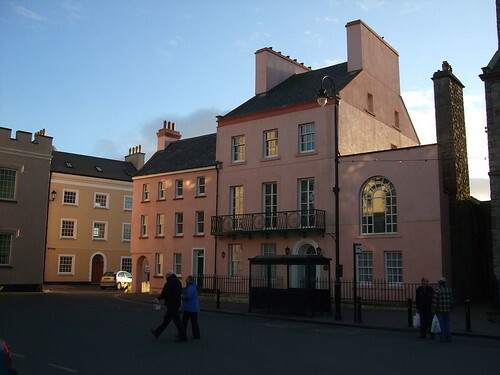 At the end of the war he returned to the Isle of Man, investing his considerable wealth in properties, including the Balcony House in Castletown which was built for him as a town house and continuing his career in politics. He was re-elected a Member of the House of Keys in 1817, and on December 21 of that year he married Margaret Stevenson at Castletown. The couple had no children. In 1826 Captain Quilliam was instrumental along with Sir William Hillary in the formation on the Isle of Man of a District Association of the Royal National Institution of the Preservation of Life from Shipwreck. He also served as Chairman of the Committee for Shipwrecked Seamen. 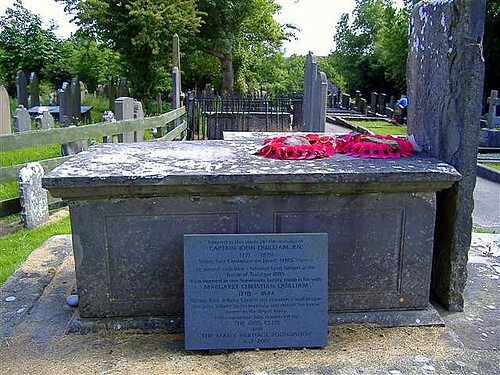 Captain John Qulliam RN died on October 10, 1829. He was buried in the Stevenson family vault in the graveyard at Kirk Arbory with the following inscription on his tombstone. In looking at a Manx hero as the subject of a new book, John Quilliam’s story is an inspiration. He is an example of a man who might have lived a fairly undistinguished life as a stonemason, a farmer or a fisherman. Taken by force from his family and his home he was thrown into an unfamiliar life, and he seized it with both hands and more than made the best of it. Captain John Quilliam RN and Petty Officer Paul van Daan were contemporaries and served in the navy at the same time although Quilliam was ten years older than my fictional hero and remained with the navy while Paul moved on to the army. By the time Paul was pressed in Antigua in 1796, Quilliam was about to receive his first commission. I’m looking forward to a new area of research and finding out more about the navy and the Manx role within it.